This is John Arley. Singer/songwriter. Hanging out on Rainey Street. I was heading to El Naranjo for some din-din. They were closed, but directly across the street, John was playing guitar and waved me (a total stranger) over. Clearly he’d had a few beers, but was kind enough to offer me one. After a long day, there’s nothing better than a cold beer and hanging out on your porch/lawn/terrace/etc. I grabbed two beers and he commenced playing four original songs. All of them really good. It was interesting. Lot’s of people walked by. 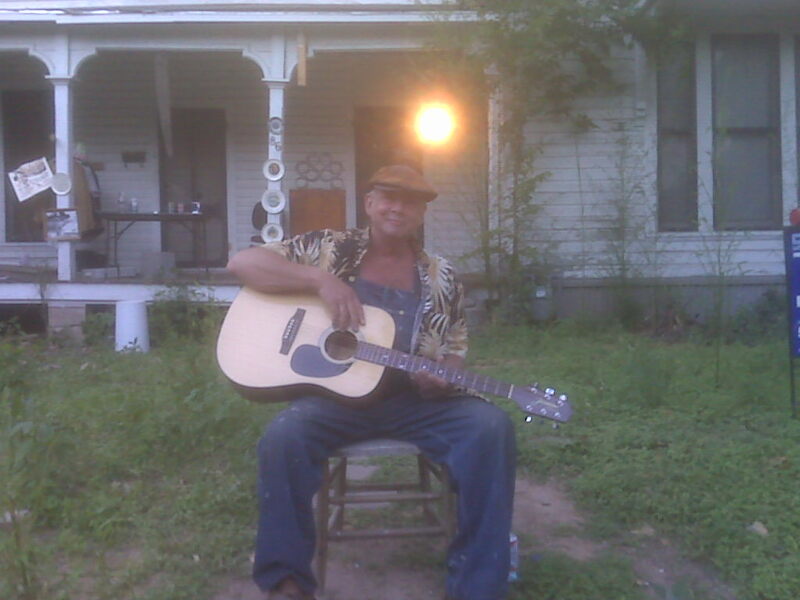 He invited everyone to hear a song, but nobody took the bait. Most people are so caught up in their own world. I let my guard down for a second, and glad I did, because I was able to join him in just relaxing with good music, company (even a stranger), and cold beer. 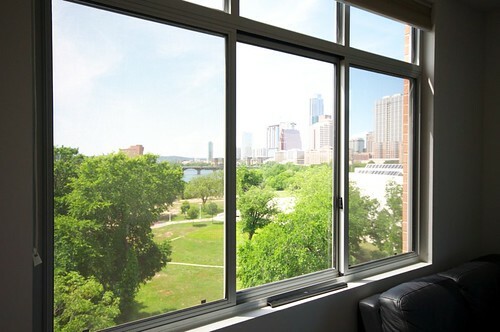 That’s what I love about Austin. John says he doesn’t know how to use a computer, but if he ever manages to get online I hope he finds this. Downtown Austin’s stretch of I-35 will receive some much needed improvements, confirming our report from September of last year. Short of burying or capping I-35, these improvements are the best we can hope for. A grant from Keep Austin Beautiful (KAB) will contribute $250,000 towards the landscaping. City Council set aside $1.5MM in form of non-tax supported certificates of obligation (bonds, I guess?). 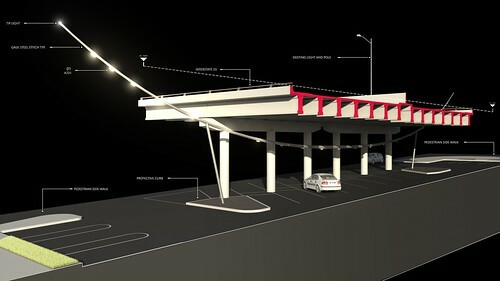 Revenues from the parking underneath the freeway (which will be completely redesigned) will also fund the project. The project is expected to start in June and take approximately seven months. 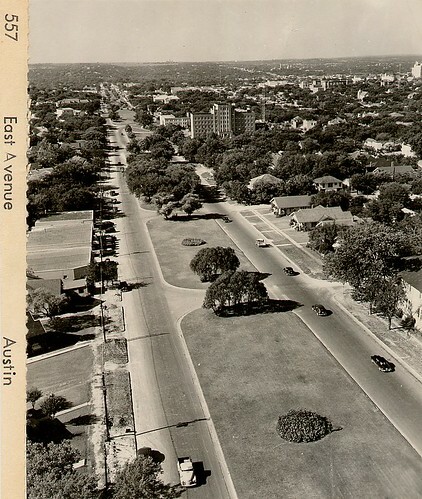 Below is a photo of Eastside Drive East Avenue, the boulevard predecessor of I35. Council has voted to approve the zoning change request by Schlosser Development, according to a report by InFactDaily, for the proposed Shoal Creek Walk office, residential, retail tower. Though not out of the fire yet as this was only a first reading and council member Laura Morrison dissenting (shocker! ), it’s a good indicator that Schlosser will receive the requested zoning change from downtown mixed use (DMU) to downtown mixed use central urban development (DMU-CURE), a change that is necessary to increase the height limit from 120 feet to 350 feet. Much of the property is encumbered by a Capitol View Corridor. Schlosser has been making the rounds, and building stakeholder support for this project, for a couple of months. The new development would replace the surface level parking lot just east of Whole Foods. What’s interesting about this zoning review case is that Schlosser is not requesting more density, as measured by FAR (floor to area ratio); rather, they are seeking more height in part of the building, to compensate for the CVC restricted height in another part of the building. Taking the wind out of the politcal sails of anti-growthers, Schlosser offered up an affordable housing proposal. This is interesting because they are not seeking more density, and therefor have zero obligation to subsidize affordable housing, or pay a fee-in-lieu of affordable housing. Another office tower was recently announced, next to Gables Park Plaza, not far from Schlosser’s site.